I may not talk about it much but I do still knit. Pretty much every day. 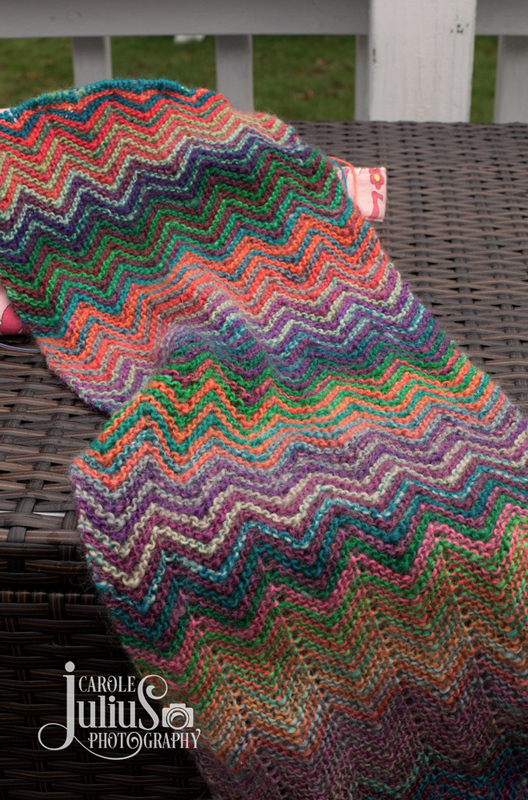 I’m currently slogging my way through 2 projects – a pair of socks and a ZickZack Scarf. Okay, the socks aren’t really a slog because I love them but the scarf? Size 2 needles, my friends. I think I’ll be at this one for a while. ooohhh, pretty! I just read Mason-Dixon about Ann starting an Alice Starmore sweater. I almost spit out my coffee at her closing line “the point here people isn’t to finish, but to start”…. you will surely finish yours! Sometimes it’s nice to have a long-term project on the needles, and this one certainly qualifies in that category. When finished it will go with almost any color clothing! GMTA? Was just thinking about this one for a gift. Then my Inner Fortitude read “Size 2 needles, my friends.” And it withered a bit right there. Maybe I’ll try to find yarn that would at least be size 3. May your own Inner Fortitude be made of sterner stuff. I looked at the yarn when I was at my LYS, and I admit it is absolutely gorgeous. But. size. 2. needles. Yeah. I will just admire yours from here. But, it is gorgeous – really beautiful. I love the zig zag color stripes. I have wanted to knit this one since it first appeared on the Ravs. It will be absolutely stunning. And . . . how nice to have a rather mindless and never-too-dull (because color changing) project to turn to when you need just plain, old knitting. How pretty. Love the colors! I impulsively bought the yarn to make one of these at Stitches Midwest last year. I started it and have knit maybe a foot or so of it. I should get it back out and work on it a little bit every day so I can get it finished before Stitches rolls around again this year in August. The colors are beautiful, but yeah. . . size two needles! Good thing it’s pretty – those size 2’s are a challenge! The colors are so beautiful…but size two needles? Really? I liked hearing that you knit almost daily. Your scarf looks great. I’m slogging through mine as well. I think it may be my vacation knitting next month. Maybe it will be done for next winter. Your scarf is looking really good! I need to start working on mine a lot more often – hopefully so I can wear it this coming winter – LOL! I’ve thought about making that scarf a few times! It will be nice to see how yours turns out. Looks good so far! Beautiful scarf…beautiful colors! Who cares how long it takes…you’ll love it forever! I’m trying not to jump down Kay and Ann’s (Mason Dixon knitting) rabbit hole and begin an Alice Starmore sweater. I’ve always wanted to knit one, but I think the timing for this is really bad for me right now. I’m trying to decide with my head and not my heart, and admire from afar! I have sort of put my Zick zak on hold for a bit as I have a couple of summer sweaters I want done NOW! I also changed out that colour called for as there was tooooo much neon for me in that one colour! Yours looks very pretty …so maybe I overreacted to the neon…oh well, I like what I have now…Although it may be September before I get it done with the other stuff…love your blog! seldom comment. I have yarn in my WEBS cart for this scarf. Haven’t pulled the trigger yet.